Biography of English Figurative Artist, Genre Painter. The significance of the great English engraver and painter William Hogarth requires a little introduction on the state of English art at the start of the 18th century. The death of Sir Godfrey Kneller in 1723 brought to an end the long dynasty of foreign artists which had dominated English painting for two hundred years, but no sign was yet to be seen of that revival which has made the eighteenth century so glorious a chapter in the history of English art. Kneller's pupils and followers were conventional 'portrait manufacturers', whose work had neither life nor charm. He was succeeded as serjeant-painter to the king by Charles Jervas (1675-1739), a typical member of his school, memorable more for his conceit and for his friendship with Pope, whose polite verses to Jervas do more credit to his friendship than to his critical judgment. Jervas, however, was not the best of the painters of Kneller's school. Michael Dahl (1656-1743) and Jonathan Richardson (1665-1745), though little more than imitators, were painters of a somewhat higher order, and Sir James Thornhill (1676-1734) made a gallant, if not very successful, effort to raise English figurative painting out of the ruck into which it had fallen. But it was left to his pupil and son-in-law, William Hogarth, to restore English fine art painting to dignity and honour. It is useless to try to account for the sudden appearance of genius at a given time and place, and that Hogarth, Reynolds, Gainsborough, Wilson, Turner, Constable, and a score of other great artists appeared in England within a hundred years can only be accepted as a fact. But conditions were changing, and the circumstances of the eighteenth century were far more favourable to the growth of a national school than those of the sixteenth and seventeenth. The religious and political dissensions which had followed the break with medieval tradition, added to the maladministration of the Stuart kings, and the comparative poverty of the country, had given little opportunity for the spread of general culture in England during the seventeenth century. But with the eighteenth century came internal peace, stable government, a steady increase in the nation's wealth, and a consequent widening of the bases of culture. Patronage, which had been confined mainly to the Court and aristocracy, was extended to a wealthy upper and upper-middle class, whose taste was enriched by travel. The "Grand Tour" of France, Italy, and Germany became part of the general education of a young man of moderate means, and a knowledge of the works of the old masters became disseminated among a much wider class in England. The long years of Walpole's administration were a period of rest and recuperation, during which the English people acquired solidity and a growing sense of unity and patriotism which had not yet degenerated into the extreme insularity of later times. National pride was quickened by the artistic glories of other countries, and a desire for a national school was awakened. The works of Claude, Poussin, and the Dutch realist masters aroused a taste for landscape, which opened a way for the English landscape-painters, whose work in the early nineteenth century was to transform the face of European art. In the eighteenth century, too, schools of art came into existence, societies of artists were formed, and public exhibitions of their work were held for the first time, and finally the Royal Academy of Arts in London was founded in 1768 under the auspices of George III. All these factors combined to raise the general level of the arts, although some of them ultimately had evil as well as good effects. Since the foundation of the Royal Academy, the fortunes of English art have been very closely bound up with it, and the Royal Academy Schools, however much their methods of tuition may have been open to criticism, have been the chief nursery of artists in England. But at the beginning of the century the only schools were the studios of the portrait-painters, and these, though the purely technical training in them was probably good, had only a debased tradition to hand on to their pupils. It was in one of these studios, that of Thomas Highmore, that Sir James Thornhill was trained, and he had already made some reputation as a portrait-painter, when a journey through France, Flanders, and Holland turned his attention to decorative painting. On his return he devoted himself to this branch of art, and to an attempt to raise the standard of painting in England. Besides carrying out large schemes of decoration, the most important of which are those in St. Paul's, Greenwich Hospital, and Hampton Court, he formed an Academy of Art in Covent Garden. That Thornhill had real gifts is proved by the sketch for a decoration, "A miracle of St. Francis", in the National Gallery, in which the flashing rectangles of the design actually recall the art of Tintoretto. But before English painting could make a fresh start it was necessary to get back to something simpler and more sincere. The work of Rubens and the later Italian painters was the final result of a long process in which their elaborate and cultivated art had slowly developed from simpler forms based on a sincere study of nature. To imitate their results without the solid basis on which they were built, was merely to produce artificial flowers without life and without seed. It was because the art of Hogarth had roots deeply stuck in the life of his own time and his own people that he was able to restore health and vigour to the sickly stem of English painting. William Hogarth, the son of a schoolmaster and literary hack, was born at Ship Court, Old Bailey in 1697. About 1712 his father apprenticed him to Ellis Gamble, a silversmith in Cranbourne Alley, Leicester Fields, from whom he learned something of the processes of engraving, and acquired a steadiness of hand and practice in design which were more valuable to him than the studio tricks which he would have picked up from one of the fashionable portrait-painters. He took to drawing, it is said, because he wished to record the humours of London life as he saw it, and he devised a system of drawing by memory, in which he could note down in the evening the things seen during the day, which had impressed and amused him. This was surely the right way for him to begin. His artistic language grew out of his thoughts, and he drew because he had something to say instead of learning an elaborate and artificial style which corresponded to no realities in his own mind. This is the only way in which a living art can be produced, for just as in speech the words must accurately fit the thought, so in the visual arts the form must be the appropriate clothing to an image in the mind. Here lies the difficulty in learning from foreign schools. Style is only vital and expressive when it is exactly informed by the indwelling spirit, and the artistic language which has been evolved from the customs, traditions, and habits of thought of one people cannot be made to fit those of another. In Hogarth's day, despite a vibrant English language, there was no equivalent system of symbolism ready for his use in the practice of painting, so he was forced to create one for himself. A man of less dogged, pugnacious, and self-confident temper than Hogarth would have failed, but he had just the qualities to enable him to resist the fashionable superficialities of the day, and to be determinedly and insolently himself. Portraits of him show a bullet-headed man with an alert eye, a pugnacious nose, a firm mouth, and altogether something of the look of a Cockney prize-fighter who could take and give punishment. Of course there was much more in the man than that, and underneath all his satire, impudence, and humour there lurked the English poetry, sentiment, and love of a tender beauty, but it was the harder qualities which gave him the power to do what he did for English painting. In 1718, his apprenticeship to Ellis Gamble over, he found employment in engraving coats of arms and shop bills, his earliest known work being his own engraved card, "W. Hogarth, engraver, April 23rd 1720". From this work he went on to book illustration, and in 1724 published the "Burlington Gate", the first of his original satires. In the same year Sir James Thornhill's Academy at Covent Garden was opened, and Hogarth attended it to learn the craft of oil-painting, and in the course of a few years he had begun to establish himself as a painter. His plates to Butler's Hudibras in 1726 had already brought him some professional reputation as an engraver. His earliest paintings were small portrait groups or "conversation pieces", as they were called, and from them he proceeded to the various series of satirical moralities with which his name is mainly associated. The first of these, "The Harlot's Progress", was painted in 1731. Meanwhile changes in his private life had been taking place. In 1729 he eloped with the daughter of Sir James Thornhill, and in 1733 he settled in Leicester Fields, where he remained for the rest of his life. From this time on his life is mainly a chronicle of work, but in 1748, in one of the rare intervals of peace, he made a memorable journey to France, which bore fruit in the picture of "Calais Gate", now in the National Gallery. While making a sketch of the old gateway Hogarth was arrested on a charge of espionage and, though subsequently released, the incident had the effect of confirming his truculent insularity which finds full vent in this picture. Hogarth contrived to the end of his life to produce satirical engravings and paintings, but he also painted a fairly large number of portraits, and a few pictures in the "grand historical style", which are not on a level with his other work. Late in life he published his "Analysis of Beauty", in which he expressed his own aesthetic ideals, and endeavoured to establish a definite canon of taste. In 1757 he received some official recognition in his appointment as serjeant-painter to the king, but he died on 26th October 1764, four years too early to become one of the foundation members of the Royal Academy. Hogarth's work, disregarding the distinction between oil-painting and engraving, falls naturally into four categories: conversation pieces, satirical moralities, portraits, and historical paintings. In all of these, except the last, for which he had neither the natural gifts nor the education, he showed a vigour, originality, and inventiveness which owed very little to the art of others. If any affinities are to be found, they are with some aspects of the art of Venice and Flanders rather than with his contemporaries and predecessors in England. But from the beginning to the end of his career he was consistently himself, and such likenesses as are to be found in his work to Pieter Brueghel, Canaletto, and Longhi are probably accidental. If he borrowed at all, it was only what was exactly suited to the needs of his personal expression, and it became an integral part of his own work. Technically his painting was in the Kneller tradition, and this was a sound one of fluent direct paint, but certain almost calligraphic passages of very liquid paint suggest that on the technical side only he may have owed something to Canaletto, who came to England in 1745. The work of Canaletto was known in England before that, and it is at least possible that Hogarth may have studied it. That Hogarth knew the work of "Old Brueghel" is highly improbable, but there is a clear affinity between them. The connecting link, no doubt, is to be found in the Dutch and Flemish low-life painters of the seventeenth century, some of whose work Hogarth would have known. This is a case of a living tradition, which having begun with Brueghel, blossomed again when it came to the hand of another great artist. Hogarth's range was, of course, far more restricted than Brueghel's, and there is nothing in his art to compare with the great landscapes at the close of Brueghel's life, but as a satirist, Hogarth had a more subtle and penetrating wit, and his work is informed by a kind of moral indignation which had no part in the peasant buffooneries of Brueghel. What they have in common is the direct reaction of a strong and humorous spirit to the foibles and grotesqueness of life as they saw it, and the ability to give a formal significance to their comments which redeems them from being simply painted jokes. Hogarth was never a caricaturist, and he never falls into the error of making the characters in his satire mere personifications of some vice or virtue. With all the teeming fecundity of his grotesque invention he never loses sight of reality and, however much his characters may be given over to avarice, drunkenness, or gluttony, they remain human beings with other potentialities of vice or virtue. They are conceived in the round, and not as changeless cardboard profiles. In contrast to many English artists Hogarth had a prodigal inventiveness, not only of grotesque types and incidents. These, indeed, are rich and varied as life itself, but he is equally inventive in the formal design of his pictures. These qualities are best seen in his satirical paintings, engravings and etchings, but even in the small conversation pieces, with which he began his career as a painter, they are to be found. The fashion for these small intimate family groups had been set by some of the Dutch little masters, whose pictures were well known in England, and in some ways Hogarth was well equipped for such work. His sense of character, keen observation, and gift of dramatic grouping were here very much to the point, but his sense of humour, which he could only indulge slyly, must have been something of a handicap to him. In these pictures his sense of character and humour are both rather cramped, and the edge of his wit is blunted, and they appeal to one as often as not through that element of the ridiculous which has crept in unawares quite as much as by the perfect fulfilment of the conditions of this difficult genre. Yet even in these, Hogarth shows a great superiority to the works of contemporary painters, such as Joseph Highmore. Hogarth must have felt the cramping limitations of this genre himself, for he soon turned from conversation pieces to the various series of moralities, such as "The Harlot's Progress", "The Rake's Progress", and "Marriage a la Mode" (National Gallery London), in which his individual powers had much greater scope, though the purely story-telling element in them sometimes a little obscures his gifts as a draughtsman, colourist, and designer. Midway between the conversation pieces and the satires stand his theatrical pictures, such as his theatre interior during a performance of the Beggar's Opera (Tate Gallery). These pictures give a clue to some of the qualities of his work, which in no bad sense is rather theatrical. Indeed, the theatre influenced his work far more than any painter living or dead. His pictures are conceived as stage scenes or tableaux set against a more or less conventional back-cloth, without any attempt at exact realism of lighting or atmosphere. His aims were entirely dramatic, and the stage supplied him with a set of conventions which enabled him to give a concentrated force to his delineations of character and action. He was not a realist, but a creator, and life in his pictures is not presented in its crude form. The raw material of his art, the life of his own time, has in its passage through his brain become formalized, stylized, and transmuted to the gold of his own creation. If he had been content with realism, he would have been able to cram into his work far less meaning than he did and, modern ideas notwithstanding, we must recognize that Hogarth's immediate aim in these pictures was to tell a story with a moral, and that the aesthetic qualities were subordinate to his primary purpose and grow from it. To make his characters tell the story as clearly and emphatically as possible he employs poses, gestures, and groupings which are more than merely natural, and he invented a form for his picture which is most nearly comparable to the form of the ballet, in which action is stylized to give the utmost expressiveness within the limits of the medium. The way in which Hogarth deals with these limitations and creates from them positive virtues is what gives these literary pictures their aesthetic significance. In overcoming the limitations which immobility and lack of speech impose upon his figures as actors, he was forced to the invention of witty gestures and poses which in life would be over-emphatic, but which in the make-believe world of his pictures are entirely natural and appropriate. Just as on the stage itself pure realism is flat and ineffective, and conventions are necessary to convey the illusion of reality, so Hogarth creates his illusion while constantly violating the canons of strict realism. When we examine his pictures inch by inch we find that they are full of clues to the story, and that they can be read as well as looked at. If he had only been able to convey his meaning in this way his pictures might rightly be dismissed as merely literary art, but, as it is, the very shapes and colours themselves are informed by a wit and satire which mould them to a formal arabesque. Behind all this creative ingenuity there lies a very simple and manly morality which is its mainspring. 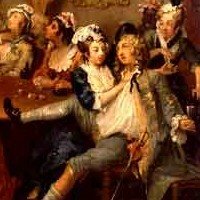 In an age of lewdness, chicanery, and corruption Hogarth stands for the simple virtues of honesty, sobriety, and decent love, and it is this simplicity of sentiment which has given his pictures the wide popular appeal of old-fashioned melodrama, of Dickens, or of Shakespeare. Vice and virtue are clear cut in his pictures, and he has the same relish and gusto for a good villain that has marked the great popular artists of all time. He enjoys his villains with the zest of Shakespeare in Iago, or the medieval artists in their devils. In his portraits these traits find less scope as a rule, but in one of them, "Simon Fraser, Lord Lovat", Hogarth created the finest rogue in all his gallery of scoundrels. This picture stands between his moralities and the rest of his portraits, and is one of his masterpieces. 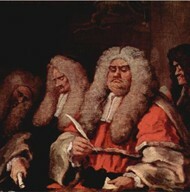 Lord Lovat was under sentence of death when Hogarth painted his portrait, and one may believe that Hogarth did not feel hampered by the restrictions which usually beset the portrait-painter. In the result it contains most of the virtues of the portraits and the moralities. Not overburdened with literary matter it has as much malice and satire as the "Marriage a la Mode", and is as penetrating a piece of character-reading as the portraits of his own servants. Certainly it was a subject to inspire a painter of Hogarth's gifts. The great Johnsonian mass of Lovat's body supports a head which is genial villainy incarnate. No trace of repentance or regret is to be seen in the eyes of the wily old lawyer who is facing death staunch in his villainies, and glorying in them to the last. Hogarth did not find such a subject as this again, but all his portraits, even the most formal and official, have an acute sense of character, and are direct and manly presentations devoid of affectation or pretence. The group of portrait heads of his own servants is the most sympathetic of all. As in the portrait of Simon Fraser, Hogarth obviously felt quite free from all restraint in painting these, and they have an intimacy and tenderness rather rare in his work, but whioh peeps out occasionally even in the satires. Here the various characters are most subtly differentiated, and it is possible to read from the picture very clearly the relationship between Hogarth and his various servants. There is no more human and revealing picture in existence. Hogarth's other portraits are not on quite so high a level, but these two set a standard which no portrait-painter could be expected constantly to achieve. The portrait of his sister (National Gallery) with its fine colour, sharp characterization and vivacity of expression, perhaps ranks next to them, but his level was a consistently high one, and it is not easy to differentiate. "The Shrimp Girl" (National Gallery) can hardly be called a portrait, and this brilliant sketch stands quite alone in Hogarth's work, both in sentiment and technique. It is entirely without satire, and cannot even be called a character study, it is simply a radiant expression of sheer joy in life, a joy which informs every swift and gracious stroke of the brush and fixes a fleeting beauty on the wing. Hogarth's art never reached a higher point than this. Technically it is quite unlike his other work, the touch is as light and the paint as thin and fluid as Gainsborough's - a kind of impressionism which the subject itself evoked. It is a further proof of Hogarth's pure artistry, in which the technique seems to be inseparable from the subject which inspires it. Hogarth had no immediate followers, and though his direct influence on English art was slight, indirectly it was incalculable. Directly, caricaturists such as Rowlandson, Gillray, and Cruikshank owe something to him, and the didactic tendency of much subsequent English painting may perhaps be traced to him, but his real importance lay in bringing English painting into touch with life and ridding it of stale conventions. The connoisseurs of his own day considered him rather a vulgar painter, as did Reynolds, but the vitality of his work none could deny. He swept away the stale atmosphere of decay like a great wind, and left behind a fresh air in which a new art could grow up. He made art popular by dealing with a life which the people knew in a spirit which they could understand, and by his engravings he brought his art to classes who knew little of pictures. So, though the subsequent developments of painting in the eighteenth century do not follow directly from Hogarth, he made them possible, and he is rightly considered the founder of the modern English school of painting. Of Hogarth's immediate contemporaries none show a vitality in any way comparable to his. A decent technical competence and some occasional charm of colour is all that can be granted them. Joseph Highmore (1692-1780) and Thomas Hudson (1701-79), the master of Reynolds, are typical. Both could paint very well so far as the actual handling of brushes and pigment goes, but they brought little life to their work. Highmore certainly had some charm and a moderate sense of character which is well illustrated by his portrait of "A Gentleman in murrey-brown velvet" (National Gallery). But a comparison of his illustrations to Pamela with Hogarth's works, which hang near them in Trafalgar Square, shows how poor and thin was his inspiration in spite of a certain gracefulness. Allan Ramsay (1713-84), the Scottish portrait-painter, may be ranked with Highmore, to whose work his portraits have some affinity. Thus it was left to the younger generation of English painters, like Reynolds and Gainsborough, to carry the torch which Hogarth had lit. Works by Hogarth can be seen in the best art museums in Britain.  For more biographies of great painters, see: Famous Painters.  For more about 18th century figurative painting in England, see: Homepage.